2 of 5 Fit pie crust into a 9-inch pie plate. Fold edges under and crimp. Combine butter, onion powder and thyme. Brush mixture over crust. Prick crust with a fork. Bake for 12 to 15 minutes until lightly browned. Remove from oven and allow to cool. 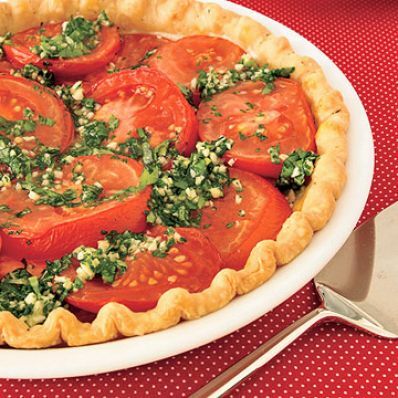 Reduce oven heat to 350 degrees F.
3 of 5 While crust is baking, place tomatoes in a colander and sprinkle with salt. Allow to drain for 15 minutes. 4 of 5 Spread mustard over bottom of pie crust. Sprinkle the cheeses over the mustard. Fan the sliced tomatoes over the cheeses. Bake at 350 degrees F for 35 minutes or until nicely browned and tomatoes are softened. 5 of 5 Mix together the olive oil, garlic, parsley and basil. Remove pie from oven and spoon the olive oil mixture evenly over the top. Allow to stand for at least 15 minutes before cutting into 8 wedges. Per Serving: 1 g fiber, 695 mg sodium, 6 g pro., 14 g carb., 220 kcal cal., 6 g sat. fat, 16 g Fat, total, 22 mg chol.